When it comes to SEO, the importance of outreach can never be underestimated. In addition to actively improvement your own content, you should be looking to reach out to other platforms. Social media optimisation is a big part of this and, when it comes to talking directly with your audience, few platforms are as important as Twitter. 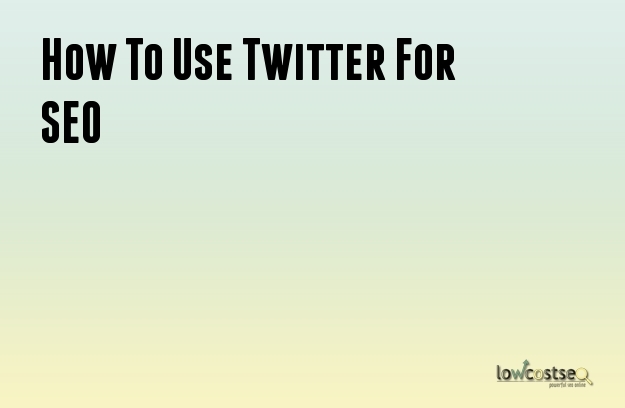 Here, we take a look at how to use Twitter for SEO purposes. First and foremost, your twitter account should clearly be linked to your website or business. Social media is full of imitation and other illegitimate accounts, so you need to be clear with your authenticity. Your twitter name should represent the company you are, rather than a specific niche or department. Similarly, while the handle doesn’t need to be the same, it should clearly be related. Put it this way: if readers aren’t sure you’re the real deal, then they’re not going to click through to any links you present, follow or engage with you. This would mean all your additional SEO developments go to waste. While most SEO services optimise your website through links and other ways of letting people find you, Twitter is a little different. If people find you, they can talk to you and it’s worth your time to respond. Talking to your customers is vital, as they are not going to invest in a service or product that doesn’t answer them. Even when it’s just a one-on-one interaction, other users see this. Just look at some big brands that offer customer services, including public apologies and rewards – via Twitter. Other users see this, share it and spread it through the likes of Buzzfeed. Before you know it, a great Twitter account is a way to generate natural traffic straight to your website. We’ve previously spoken about how to find the right keywords for SEO purposes. The same is true for Twitter. After all, people need to find your tweets and with over 300 million people actively on the platform, it’s a crowded space. Yet the right keyword, as always, acts as natural filter. If you’re selling a product, such as shoes, then you need to make this clear in your tweets. If you don’t include this one simple word, your tweet isn’t going to be heard loudly and you’re links aren’t going to clicked through. We’ve also previously mentioned that social media is a great way to get feedback, so use this opportunity to develop the right keywords – how do customers refer to your product when talking directly to you? Are they sneakers, or trainers, for instance? Always pay attention and always adapt. Finally, all of this is useful as long as you still link back to your website. Promotions, product pages and other areas are all worth linking to, if its what you audience wants. While you can expand with other social platforms, such as Instagram and Facebook, this audience and linking power will get lost if you never actually make the connection to your website.